The Chakala Metro Station is part of the new Metro Line 1 in Mumbai, India. It is the first metro line in Mumbai and it is designed to offer the citizens a more efficient and sustainable way of moving through one of the biggest and most congested cities in the world. Given the extraordinary alternative provided by this new mean of transport, a huge number of people will decide to use the metro instead of the private vehicle. It appears therefore vital the verification of the vertical and horizontal pedestrian links, and of check in/out devices in order to provide the users a comfortable and safe experience. 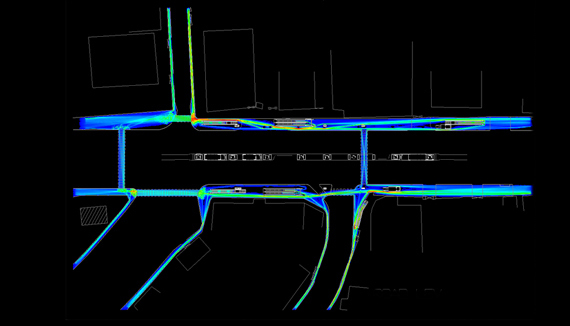 To this aim, Systematica successfully delivered a pedestrian modelling study focused at verifying the level of service throughout the structure in Years 2013, 2021, and 2031. Comfortability and safety of pedestrian links are assessed for multiple time-scenarios to ensure high level of service of the metro station.